Last summer, when I was out and about in Grandsable Cemetery I found the stone of a man that was far more famed in Scotland when playing in the Green & White Hoops than in Falkirk's Navy Blue [never mind his time in England]. Such is the manner of Scottish Football. 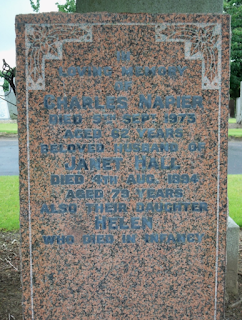 I am talking about Charles Edward Napier, son of the former Falkirk FC Secretary Charles Edward Napier. Yes, he had Falkirk FC in his blood before he left Alva Albion Rovers for Celtic. 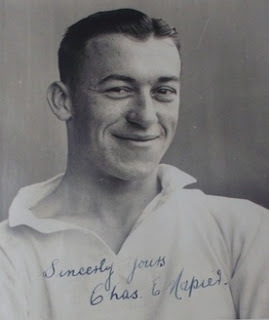 Not saying a word against our brothers in Glasgow but Chic Napier was a Falkirk boy, and when European conflict sent him home he came to Falkirk. Picture 'thefted' from the Celtikwiki: I hope they forgive me. All in all Charles [as the local Falkirk Herald respectfully called him] played in more than a hundred matches and scored [from midfield] nearly 50 goals for Falkirk: these are figures that shame some of our best centre-forwards of recent years [written 2018]. There are those out there that might say his 'home club' was East Stirlingshire, but as the 'shire 'wound up for the war we were the local team. We can say very little about Charles' time at Falkirk as, as anyone who has tried to research football during the War will know football reporting was limited from both sides, both from physical limitations on the amount of paper and from the Home Office limiting the facts that could be said. But facts speak more than my words and these are the facts of Charles Napiers' time at Falkirk.